This was a race that had long been in the calendar, having been entered quite some time ago. 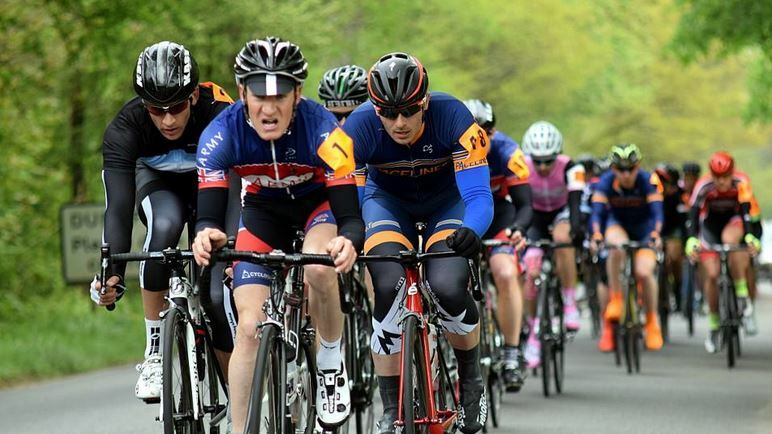 The race is open to category 2 and 3 riders, and features 3 stages, Alfold/Dunsfold, Bletchingly and Lingfield. Teams of 6 are permitted to enter. I had put my name forward for Paceline and was going to be riding with Pat, Gareth, Dom, Adam and Jon. The week before the race I had Cutmill, which really showed up my climbing ability in 2/3 races, so was even more worried about the race, with Bletchingly a very difficult circuit with two main climbs. I was also most nervous about how I would recover between stages, but as it turns out this wasn’t a huge issue. With stage 1 at Alfold and Dunsfold circuits my main aim for the day would be to just finish in the bunch and try not to lose much time. I was being realistic in that I knew I wasn’t in contention for any GC leaderboards, but thought I could maybe sneak into a stage result if I was lucky, failing that just be of help to the team where at all possible. The stage was always going to be interesting as Gareth had decided he would only be riding Day 1, and so could ride aggressively. As everyone gathered in the car park ready for the stage I was shivering and probably the most nervous I’d been before a race for some time. There was a strong field and not knowing the circuit also made me nervous. We set out, and with no neutralised zone to ease us in the pace was immediately fast from the off, on what was a shocking surface to begin with. Having not had great legs all week I was pushing quite hard in terms of perceived effort just to keep touch with the bunch. I was concentrating most on avoiding dropped bottles and potholes, and trying to take in the course as well as watching when I could. Something which I failed to do as Gareth formed a break with several other riders and got up the road without me or several others in the team noticing. At around the 20mile mark I noticed the pace slow, and could see Wyndymilla at the front marshalling things. I was pretty glad of this with my legs feeling as they did and took the time to sit in. 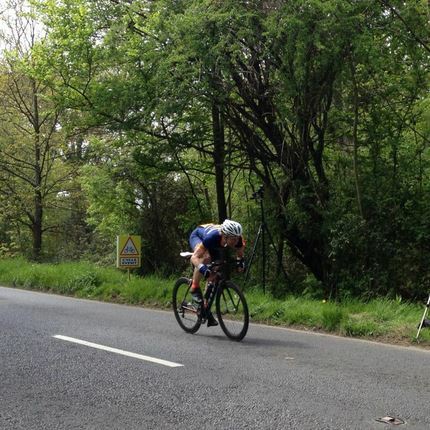 After quite a while I could see several attackers trying to get up the road, I was feeling ok by this point about 40 odd miles into the race, so decided to move up and get near the front for a bit. Mostly as sitting in waiting for potholes to run through was becoming tiresome, not to mention dangerous. It was nice to sit on the front for a bit choosing lines and it not being as stressed. I was looking around at this point and could still see several other paceline riders in the bunch. I began to struggle the last 20 or so miles, until I spotted Gareth coming back through the bunch. A quick chat at this point revealed he’d been in a break for most of the race, and had been working to the point of being spent. His break got reeled in, only for Pat to join on and have it extend back out again by 30s or so. After speaking he said I should get up to the front to try and slow the chase. By this point we were on the final lap and things were getting choppy. Riders were moving up any way they could and using the whole road. I was getting nervous, but managed to force my way up to get on the front. Once there I made a nuisance of myself and tried to disrupt the chase, which I hopefully did. After not too much further I began to slip back as I tired and found myself mid bunch again, on the way up to the finish hill. Things began to get faster as people jostled for position, I wasn’t too keen on getting into a full on sprint by this point so just tried to move with the bunch. Coming up the last hill, two riders went down in front of me and I narrowly managed to avoid clipping them, a quick dig for the line using what I had left and I had finished mid pack. 45th out of 80 odd starters. Not too bad. Looking back I probably could have put in a decent finish here, as the short sharp hill and false flat may have suited. But not knowing much about the course meant I didn’t really know how far away the line was, my fault for not recce’ing any of the race. Overall was pleased to finish in one piece, but was worried about how much it had taken out of me. Pleased for Pat who got a 3rd place finish! I rolled across to Adam’s house early in the morning after another 6:30am alarm call. I was slightly worried as I soft pedalled the 9 miles that my legs were feeling terrible. In normal circumstances I’d have been tempted to bin off a recovery ride, let alone sign on to a 70 mile road race on one of the toughest circuits in the league. We began the drive as did the rain, as we got on the M25 it was getting seriously heavy, and was becoming difficult to see cars in front of us. Grim conditions to say the least. Got to the HQ which was at a nice golf course and got prepared. I was changing wheels today to alu clinchers as I didn’t fancy a carbon braking surface in the wet, especially on a course I didn’t know. After yesterdays action the jerseys were handed out and Pat was in the green points jersey. Then the commissaires stood up and began the usual briefing, however they really put a big emphasis on the descents being dangerous, especially in the wet. They had decided to end the neutralised zone before the descent and let us race it first time. A couple of guys stood up and challenged this suggesting it should be neutralised. Now I feel confident in my bike handling usually, but this really made me nervous for some reason, on an unknown course descending in the wet was really worrying me, and other riders expressing concern only made it worse. As it was, we would race the descent first time out. So we rolled out of the HQ and made a right turn onto the high street. Things were neutralised for this drag up to the first left hander then we were racing. I was already near the back of the bunch and immediately there were gaps appearing and things were splitting apart. Onto the descent and I was taking it cautiously thanks to the briefing, and so got gapped further. First time down I was fine, and it wasn’t even that bad despite being very wet. After the descent I was now well off the back but still hopping wheels moving past other dropped riders. Eventually a sizeable group of 7 or so riders got together including me. At this point the main bunch were coming back into sight and it was looking like we could catch them. We started a decent little paceline going with people doing strong turns, however as more and more riders were shelled the paceline broke down, as people either weren’t coming through, or were a couple at the time, and in no order. I got a bit annoyed, and so powered down the descent for the second time realising this time that no brakes were needed for the descent despite the several blind turns on the way, which I began to realise was really good fun. I hung out in front of the grupetto for half a lap before getting swept up again and spending the remainder of the lap with them. The climbs on each lap were really taking it out of me though, and I was finding it hard even staying with out slower group. I was almost crawling up in my largest cog at the back in the small ring. It was around then I passed the yellow jersey who’d stopped with a puncture. A little while down the road Alex Tinsley had stopped waiting for their teammate to get his puncture fixed. Then another 10 mins or so later three twickenham riders including yellow, and a couple of others came up behind us. I tagged onto the group and got involved in their paceline. They were working quite well, and were barking orders at each other. I had to work hard to stay with them, before getting dropped on the climb once more. Familiar story. As I drifted further back I found Adam and a Maison du Velo rider. So I attempted to stay with them, by which time we were well off the back, and soaked. I stayed with Adam and the MdV guy for another lap or two before struggling so much I was dropped again. I was really pedalling squares at this point and was lacking any energy or motivation. I passed the 1 lap to go board and was so ready to quit. Had a sharp word with myself and carried on telling myself it was only another 10 miles. Grovelled the rest of the distance back to HQ by which point the weather was improving. Rolled over the line after just 6 laps (dropped riders get pulled out with a lap to go to stop them interfering with the finish) just in time to watch James Lowden power up the finish hill solo, and with a very healthy time gap to the next riders. With Pat finishing in 5th things were still looking good for his GC position. Watts were very average this race, but perceived effort was way higher than the figures let on. The alarm went off at 6:30am once more and the temptation to stay in bed was huge. The legs were hurting and the last thing I wanted at that point was ride another race. I got up and after getting ready and drowing myself in coffee I was feeling better about things. I was even more surprised to get out on the bike on the way to Adam’s and feel that my legs actually felt reasonable., things were looking up, and the weather was also playing ball. A much warmer day with sunny spells. I was careful not to push, but was now mildly optimistic at what the day might bring. From what I’d heard Lingfield was a much nicer circuit that the previous days. Still plenty of climbing but more rolling, and nothing as steep as Bletchingly. I was hopeful! Got to the circuit and the weather was the nicest of the three days with sunshine and a decent temperature. After the presentations and briefing everyone was ready to roll out, for the first day without knee warmers and overshoes! After a brief neutralised section we were on the circuit. The surface seemed decent, as we made our way towards the first climb. First time up it wasn’t too bad and I was pleased to remain in the bunch throughout. The remainder of the lap featured some rolling fast road, a big fast descent into another climb, then another descent back to the start of the lap. With some smoothish flat road in between for good measure. As we came onto the second lap it looked like Bradley the Twickenham CC rider had aims on the overall points jersey as he attacked with two other riders and went clear, looked like they had a fairly decent gap as well. James Lowden of Neon Velo (GC Leader) was still in the bunch but sat at the very front. We flew down the big descent second time round, and the bunch were moving fast, back into the climb the other side, and two riders tangled in front of me and went down. I had to all but stop to get in a decent gear in order to get going again, by which time the bunch were 150m+ down the road. I shouted at myself in frustration as at this point I thought it was game over and I’d be dropped for good, so annoying when I felt fairly strong. Spent the next couple of minutes chasing in vain at well over threshold, but couldn’t seem to gain on them. Looked back and saw an Army CU rider coming up the road, so sat up a bit and waited for him. He looked to be going well and we started a really good two up to get back on. Both putting in strong turns we were soon closing the gap, and despite having to overtake a few cars we eventually made it after half a lap. Also picking up a London Phoenix rider, who was also going ok along the way. I rested in the bunch for a minute before we were at the climb again, but I still felt ok at this point, and stayed with eveyone going up it, before taking most of the rest of the lap fairly easily. Coming back in towards the 3rd lap I noticed Pat going up towards the front in order to try and close down a break that had gone, so I put myself in front of him to try and protect a bit and put in a couple of decent turns with a Dynamo rider who also had similar ambitions of catching the guys up the road. This clearly took its toll on me as the next time up the climb I slowly drifted back through the bunch and by the top had lost contact. Found Army CU guy again at the back of the field but this time it would prove too much to get back on. At one point we were within touching distance just before the bunch accelerated again and the gap went back out. He made it known that he would be going back to HQ at the end of the lap, and feeling cooked at the time I stupidly followed. Looking back now, wish I had just rolled over the line to complete the distance, but for whatever reason I didn’t. Overall I enjoyed this experience a huge amount, its not often you get the opportunity to take part in something like this, and get a small taste of what it takes to compete on a stage race. The team element was great, and was good to ride with the other Paceline riders, each of which did themselves proud. Looking at my own development, I think it really stretched me mentally as well as physically, so I’m hoping I can push myself further in the future as a result. I’ve also gained a lot just from spending so much time racing. By the end of the race I felt I was moving in the bunch at will, and was using far less mental capacity just staying upright than I was at the beginning of the race. Hopefully in upcoming races this will mean I can observe and watch things way more. I guess it will also help me to address my weaknesses which I think for the most part is my climbing ability, which is really driven by my weight. I need to put a concerted effort in to lose another 5kg. I think I might stand a fighting chance at staying in the bunch on most of the climbs then. Even so, I think Bletchingly is still out of my grasp, as its brutal for me as a bigger rider. Interested to see what fitness impact this will have on my riding, as it was a lot of volume in a short space of time. My CTL went from 80 at the beginning to 90 at the end, so a great bump up there, almost like a mini training camp!